Canadian studio ER Yacht Design has developed a new multihull superyacht concept for Kingship Marine of Hong Kong, called the KingCat 85. 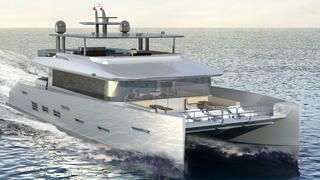 This 25.9 metre aluminium catamaran could be built to an owner’s specification in approximately 24 months. ER Yacht Design’s brief was to create a minimalist exterior aesthetic with clean lines. The yard wanted a catamaran superyacht that would handle well in a wide range of sea states and be easily manoeuvrable in a busy marina. On-board accommodation is for eight guests split across four cabins, while the crew quarters allow for a staff of two. The master suite is situated on the main deck, with easy access to both the foredeck and the upper pilothouse. Back aft, the spacious dining room would seat all eight guests in comfort. All three guest cabins are situated on the lower deck, but 2 metre headroom and oblong hull windows would ensure a light and airy feel in this area. On the upper deck, Kingship Marine would offer two options — either an open flybridge or an enclosed flylounge. 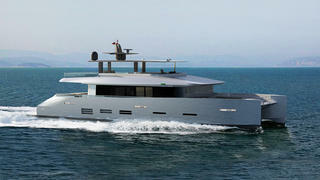 Both versions come with a superyacht spa pool and barbecue. 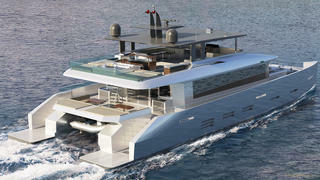 Primed for entertaining, this catamaran would also feature a wine cellar and a cocktail bar. The 9.45 metre beam of the KingCat 85 allows for plenty of internal space, with panoramic windows channelling light into the main saloon. Other key features include aft-deck tender storage, a permanent bathing platform and a beach club area in the stern. Propulsion would come from twin diesel engines paired to water jets for a top speed of 30 knots and a fast cruising speed of 25 knots.